New for 2016!! 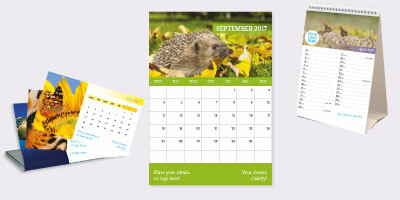 Admiral Charity Cards are excited to offer our new range of personalised charity calendars. We have three different styles to choose from: A3 Wall, Desk and CD calendar. You have the ability to customise your 2017 calendar with your logo and corporate colours. We have a nature/wildlife collection of designs available or you may want to supply your own images. Make sure your customers know they are valued and appreciated. A small gesture can go a long way! It might just be the best thing you do at the end of the year. Why give a personalised calendar? · It’s great cost-effective marketing for your business. · It’s a gift they will keep and use 365 days a year. · You can make sure it's your brand and message that’s on their wall and desk! If you are interested in our new personalised calendars range please call a member of our Admiral Charity Cards team on 0207 610 6193. We are happy to help with any questions you may have or simply to place your order with us.